A plane crash which left ex-Blink-182 drummer Travis Barker and disc jockey DJ AM with burns and killed four, may have been caused by a tyre blowout. 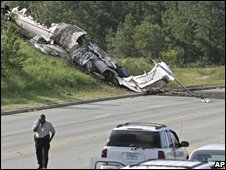 The Learjet left the runway on take-off in Columbia, South Carolina, on Friday night, and crashed on a nearby road. A safety official said that a cockpit voice recording suggested the crew tried unsuccessfully to abort take-off after hearing a probable blowout. 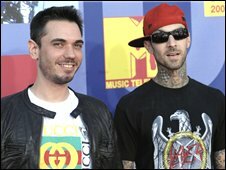 A doctor has said Barker and DJ AM are expected to make full recoveries. Both are still in a critical but stable condition in hospital in Augusta, Georgia, Dr Fred Mullins said. Both had suffered second and third-degree burns in the crash, he added. Dr Mullins said that Barker, 32, was burned on his torso and lower body while DJ AM - real name Adam Goldstein - was burned on his hands and part of his head. Their injuries could take up to a year to heal, he added. The pilot, co-pilot and two other passengers all died in the crash. Debbie Hersman, of the National Transportation Safety Board, said the recording suggested that the crew had tried to abort take-off but had then signalled that their efforts to do so were failing. "The crew reacted to a sound that was consistent with a tyre blowout," she said. Air traffic controllers had reported seeing sparks coming from the plane as it tried to take-off. Officials said it left the end of the runway before coming to rest, engulfed in flames, a quarter of a mile away on the embankment across a five-lane motorway. Barker and Goldstein, who perform together under the name TRVSDJ-AM, had earlier been playing at a free concert in Columbia. In February 2005, pop punk trio Blink-182 announced they were going on an "indefinite hiatus" with no plans to work together in the future. Blink-182 had nine UK hits including All the Small Things in 2000.